Pecan Sorghum Butter for sale. Buy online at Zingerman's Mail Order. Gourmet Gifts. Food Gifts. Can I tell you a secret? Promise you won’t tell my boss. Here it is... I don’t like pecans. I know, I know, at a company that’s wild for Spiced Pecans and gaga for Pecan Pie, I’m really not supposed to say that. But here’s the thing. 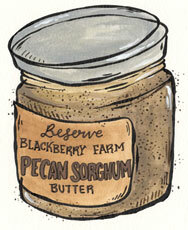 Even though I don’t like pecans, I totally love the pecan sorghum butter from Blackberry Farm in Tennessee. It’s got this deep, earthy, toasty flavor from the nuts that’s balanced with the smooth, dark sweetness of the sorghum. It would be awesome on a sandwich or even drizzled over ice cream, but honestly, I mostly just eat it by the spoonful. The pecan sorghum butter may separate in the jar—but it'll stir right back up with a little elbow grease!